ADAM33 Connection to the Asthma inflammatory pathway. Asthma is caused by inflammation in the airways. Inflammation is a protective response to an infection by the immune system that requires communication between different classes of immune cells to coordinate their actions. In sensitive people, asthma conditions can be triggered by hyperactive response of the inflammation pathway. Secreted cytokine proteins provide signals between immune cells to coordinate the inflammatory response. Using String and Biocarta I was able to make observations of the role of ADAM33 in asthma. 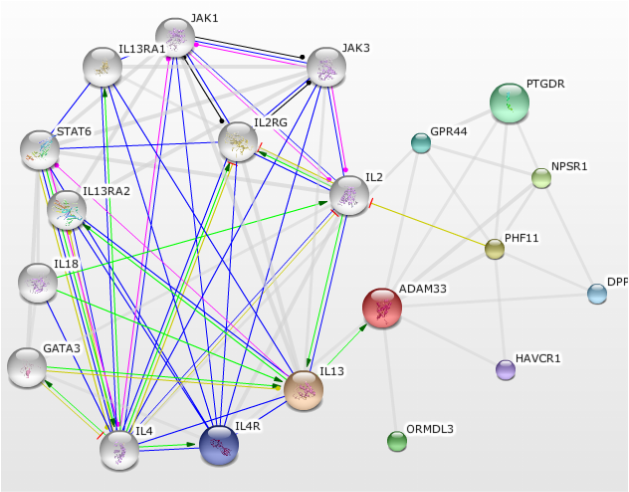 String: Interactions between ADAM33 proteins. 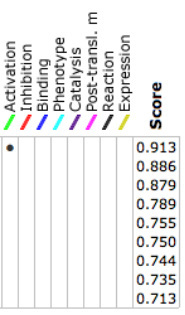 The following proteins above were found to be connected using STRINGS automated text mining. Text mining scans journal articles mentioned in PubMed to create an interaction network of proteins. ILI3 is a protein that inhibits cytokine production. It synthesizes with IL2 in regulating interferon-gamma synthesis and may be critical in regulating inflammatory and immune responses . Linkage analysis has mapped susceptibility to asthma to a region on human chromosome 5q25-31, which includes the genes for IL-13 and IL4R . String does not include specific information on how the proteins interact so further research would need to be done to determine if SNP effects activation of ADAM33 from IL13. Another important interaction to note is the pathway of the IL4 protein and ADAM33. The IL-4 protein is involved in the cytokine response pathway. This is an important pathway in determining a persons response to environmental factors. In asthmatic patients a hyperactive response to environmental factors leads to constricted airflow. The Il-4 protein activates IL4R which binds to the IL13 protein activates ADAM33. The role of ADAM33 mutations in asthma developments is unclear, but this gives interesting implications to the role of ADAM33 in the cytokine response pathway.